A.C.T. also offers a line of electric infrared heaters. Unlike quartz or ceramic emitters, our panel heaters provide continuous heat from edge to edge, without gaps, so a 5′ x 7′ oven, would actually have 35 square feet of emitting surface. In addition, our heaters do not utilize reflectors, which must be kept clean in order to maintain optimal performance. Quartz composite is the standard face on the F-Series infrared panel heater . It is produced by a patented process that uses a high temperature material and special cement to bond quartz fabric with a ceramic fiber coil support. The end result is a unique, highly durable, quartz composite face heater.The F-Seriesheater has a tremendous amount of flexibility. Its shape can be manufactured rectangular (most common), square, round, or C-shaped. The heat can be aimed in a single direction (most common) or in dual directions. Our special designs can help to avoid cold spots across wide web applications. The use of an external reflector in most electric infrared heaters results in a dramatic loss of radiant efficiency over time. Because the proven design of the F-Series heater requires no external reflector, it maintains a consistently high radiant efficiency over time. 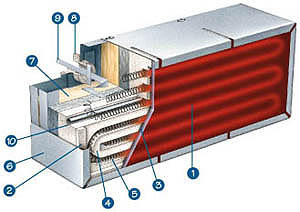 The F-Series heater is used in most process heating applications. The only applications where it might not be used are vacuum applications and those in which materials could possibly damage the heater’s face (see MGK series), otherwise, this is the perfect heater for nearly all infrared heating, drying, and curing applications. The F-Series heater can be constructed as wide as 30″ (762 mm) and as long as 84″ (2133 mm), though not that width and length in the same heater. For example, an 84″ (2133 mm) long heater is commonly 12″ (305 mm) wide. This heater is very flexible in size and watt density options. It has a maximum watt density of 25 watts/in2(39 kW/m2) and a durability defined by a typical life expectancy of 25, 000 hours. The heater has a high radiant efficiency of 78.5%. Because its design does not depend on an external reflector, the heater maintains a high radiant efficiency over time. The F-Series heat transfer rate for 25 watts/in2(39 kW/m2) is 2.4 Btu/ft2/sec. delivered to the product and for 12.5 watts/in2 (19.4 kW/m2) is 1.15 Btu/ft2./sec. delivered to the product. Glass is the standard face on the G-Series infrared panel heaters. There are two versions of this heater. The GB model makes use of a high-temperature (1202°F/ 650°C, continuously operating temperature) black glass, while the GC heater makes use of a clear (slight yellow tint), high- temperature (1292°F/700°C, continuously operating temperature) glass. The remaining construction of the G-Series heater is similar to that of the F-Series heater with the exception that glass replaces the quartz composite fabric as the face material. The glass face G-Series heater is used for industrial applications in which there is a possibility that materials will fall onto the heater’s face. A glass face allows for easy clean-up and prevents damage to the heater or heating element. Common applications for the G-Series heater include operation as the bottom oven in a thermoforming machine and as the bottom heater in a wave solder oven. The G-Series heater can be constructed as wide as 24″ (610 mm) and as long as 36″ (914 mm), though not that width and length in the same heater. For example, a 36″ (914 mm) long heater is commonly 12″ (305 mm) wide. This heater has a maximum watt density of 20 watts/in2 (31 kW/m2) and a durability defined by a typical life expectancy of 25, 000 hours. It has a high radiant efficiency of 77.5%. Because the heater’s design does not depend on an external reflector, the heater maintains a consistently high radiant efficiency over time. The G-Series heat transfer rate for 20 watts/in2 (31 kW/m2) is 1.9 Btu/ft2/sec. delivered to the product. Metal is the standard face on the M-Series panel heaters. The face can be manufactured using either hard-coated aluminum or porcelanized steel. The remaining construction is exactly the same as that used in the G-Series heaters. The heater’s face can be provided with air holes for forced airflow, as is done in the FBA’s construction. A metal face is used for industrial applications in which there is a possibility that materials will fall onto the heater’s face. Although a metal face heater is more durable than a glass face heater, a disadvantage, however, is that the radiant efficiency of metal is slightly lower than that of glass. Because a glass face heater allows a portion of the infrared energy to transmit through the glass, only a segment of the infrared energy is absorbed by the glass and re-radiated. A metal face heater, on the other hand, absorbs all of the energy and re-radiates it to the process. Especially demanding applications sometimes require a slightly different design that makes use of a hard-coated aluminum face constructed in a cap (pan) style. This design ensures that materials definitely can not penetrate the heater. The M-Series heater can be constructed as wide as 24″ (610 mm) and as long as 48″ (1219 mm), though not that width and length in the same heater. For example, a 48″ (1219 mm) long heater is commonly 12″ (305 mm) wide. This heater has a maximum watt density of 10-15 watts/in2 (15.5 – 23 kW/m2), depending on which metal face is used, and a durability defined by a typical life expectancy of 25, 000 hours. It has a radiant efficiency of 64%. Because the heater’s design does not depend on an external reflector, the heater maintains a consistently high radiant efficiency over time. The M-Series heat transfer rate for 10 watts/in2(15.5 kW/m2) is 0.786 Btu/ft2/sec. delivered to the product. Koramic is the standard face on the K-Series panel heaters. This face is a ceramic material that offers many advantages. The remaining construction for the K-Series heater is exactly the same as that used in the G-Series heaters. The heater’s radiant efficiency is between the glass face and metal face heaters. The koramic face is constructed using interlocking pieces of material in order to enable movement of the heater’s face as the heater expands and contracts. This means that the K-Series heater can be constructed for longer lengths than the G-Series heater. Koramic is an approved material for food applications. The K-Series heater can be constructed as wide as 24″ (610 mm) and as long as 60″ (1524 mm), though not that width and length in the same heater. For example, a 60″ (1524 mm) long heater is commonly 12″ (305 mm) wide. This heater has a maximum watt density of 25 watts/in2(39 kW/m2) and a durability defined by a typical life expectancy of 25, 000 hours. Because the heater’s design does not depend on an external reflector, the heater maintains a consistently high radiant efficiency over time. Electric infrared heaters in the G-Series, M-Series, and K-Series product lines use a high-temperature material for their surface face. All heaters provide a uniform coverage with a convenient, cleanable surface.